Are graduate students workers? This month, Illinois grad students answered that question using labor’s oldest weapon: the strike. The successful strike in West Virginia and ongoing efforts in the UK, Arizona, and Oklahoma suggest that a grassroots labor movement led by teachers is rapidly growing. 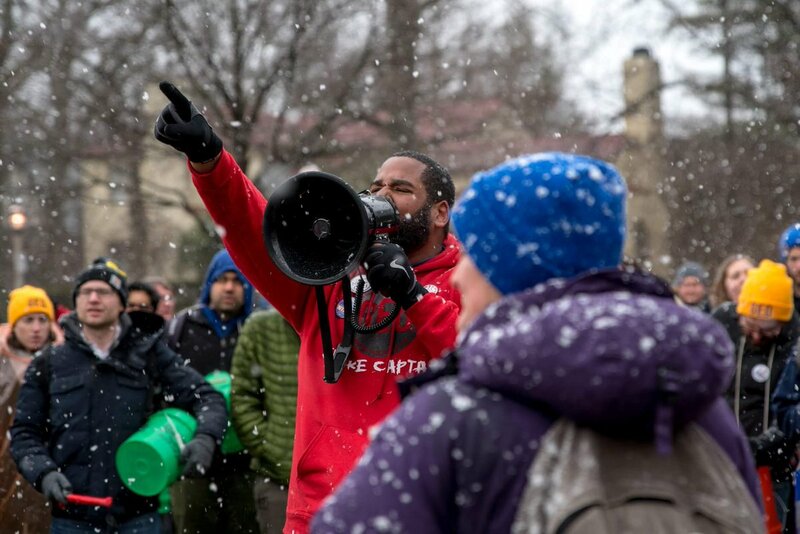 Now, as Janus v. AFSCME looms, another group of teachers — graduate students — have fought back against attacks on organized labor at the University of Illinois at Urbana-Champaign. After nearly eleven months of unsuccessful bargaining and 195 days after our last contract expired, the Graduate Employees’ Organization (GEO) began the strike on February 26, 2018. We refused to enter picketed buildings where our classes were held and we withheld our labor by immediately halting all teaching-related duties. In contract negotiations, GEO prioritized progress towards ensuring financial stability for graduate workers in the form of tuition waivers, fair wages, fee waivers, and support for health and child care. During the strike’s last days, GEO members occupied the university president and chancellor’s offices. After twelve days, GEO reached a tentative agreement with the university administration and the strike ended on March 10, 2018, after 98 percent of the membership voted to ratify the new contract. The question of whether graduate student workers are fundamentally students or workers had a simple answer during our strike: we’re both. This dichotomy between student and worker, however, has been a persistent issue throughout the history of graduate employee unionization. Decisions made by the National Labor Relations Board (NLRB) — both those prohibiting graduate students from collectively bargaining, such as Trustees of Columbia (1951), Aldephi University (1972), and Brown (2004), and those permitting graduate students to collectively bargain, such as Cornell v NLRB (1970) and NYU (2000) — have largely hinged on this conceptual question. Whatever the status of graduate student workers in the NLRB’s eyes, the reality of graduate education demands a synthesis of these identities. University administrators respond that graduate employees fail to meet the necessary requirements to be considered employees. In a 2004 decision reversing NYU (2000), the NLRB stated: “… inasmuch as graduate student assistants are not statutory employees that is the end of our inquiry.” Therefore, in the majority view of the Board at that time, grad students are excluded from the category of “employee” and so are ineligible for union representation and collective bargaining at private universities. This decision cast a shadow over graduate student unionization in general. While grad students across the country have a long history of organizing, their ability to do so has long been under threat. As we bargained for our fifth contract with the administration, we were also bargaining for the life of our union and for graduate student unions more generally. The increasing corporatization of public education limits our ability to organize by carving the bargaining unit of the union — currently defined to be teaching assistants and graduate assistants (or anyone who does comparable labor) — into smaller and smaller pieces. When university administrators view graduate workers as revenue-generating customers instead of employees, they don’t see tuition waivers as necessary compensation for labor. They see them as easily revocable “coupons” to attend classes for free. Reducing tuition-waiver generating assistantships shrinks the bargaining unit and diminishes the power it has to advocate for graduate workers. By decoupling tuition waivers from the essential labor that graduate workers provide, the administration positions themselves to bust our union. However, if one sees graduate students primarily as workers and employees, then tuition waivers are a necessary part of compensation. No one should be expected to pay for the privilege of working. Denying that graduate student workers are workers deserving of fair compensation results not only in a misunderstanding of graduate school, it also ensures that the academic world becomes smaller and smaller over time, existing only to serve a wealthy elite. Even aside from the question of whether we are fundamentally students or workers, it’s unclear why graduate student workers should accept working conditions that make financial stability impossible. Even if it were true that graduate workers aren’t employees, why should they be expected to provide surplus labor to their institutions for poverty wages? Does our new contract meet all of our demands? No. It is, however, a precondition for the possibility of a better, fairer contract in the future. Among other things, the new, five-year contract includes a “wage reopener” for years four and five. That means that when the time comes, we will have an opportunity to negotiate our wages and avoid the Campus Wage Program, which gives the university president unilateral power to set our wages. Organizing and planning for that moment has already begun. Our fight to preserve high-quality, accessible public education is ongoing. Ashli Anda is a PhD student in the philosophy department at the University of Illinois at Urbana-Champaign. Adam Edwards is a PhD student in the philosophy department at the University of Illinois at Urbana-Champaign.